Yes, go get lost, literally. 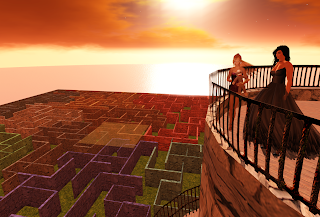 My newfound friend Connie Darcy (whom my partner Barbie and I met with her partner Bib Aabye at Babele Fashion) has constructed a colossal maze in the region Cloverfirld—two mazes, actually—by far the largest I've ever seen in Second Life. Click at the entrance to receive an optional HUD that will give you an overhead view as you walk along. It's not easy to find your way, believe me, and to make matters worse we gave up and cheated. ;-) I haven't had the energy to try the lower, harder maze yet, but if you spot me wandering lost in there, please lend a hand!